“When we get those games where we can shoot the ball well, it’s a big advantage,” said Lowry, who went 2 for 4 from distance. Wizards guard John Wall, who scored 30 points in Tuesday’s win over the Clippers, shot just 5 of 13, going 1 for 7 from 3-point range. Wall scored 11 points and had a game-high 11 assists. “I’m happy that I’m playing and we’re playing well,” Leonard said. The Raptors led 70-62 at the half. Washington took the lead with a 9-0 spurt to begin the third, but Toronto answered with a 10-2 run. Leonard scored 10 points in the third as the Raptors took a 101-87 lead into the fourth, the fourth time this season they’ve scored 100 or more through three quarters. Wizards: C Dwight Howard (gluteal soreness) was inactive. … Kelly Oubre Jr. shot 0 for 6 from 3-point range. 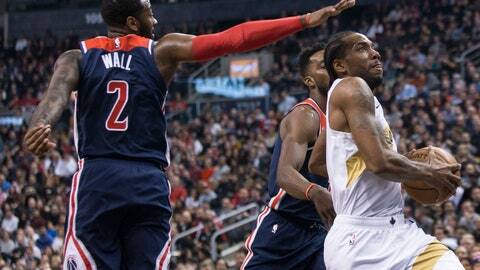 … The Wizards entered with a 4-15 record against Toronto over the past five years, its worst mark against any Eastern Conference opponent. Raptors: Leonard started after sitting out Wednesday’s win at Atlanta, the second game of a back-to-back. … F C.J. Miles returned after missing the previous five games because of a strained right adductor, while Anunoby returned after missing three games because of a sprained right wrist. … Miles shot 1 for 7 from long range. … Toronto’s high for points in a half this season is 71, set against the Los Angeles Lakers on Nov. 4. … Toronto wore its white and gold City Edition uniforms for the first time this season. … Rapper Drake, the Raptors’ global ambassador, attended the game.